You’re engaged to the love of your life, and you’ve started to plan your big day. You’ve got ideas for colors, centerpieces, flowers, favors, and more. Your pinterest account is overflowing with wedding inspiration boards. It’s all you think about, day and night. Everyone you ever knew (and lots of people you don’t) will be at your reception. This is huge, and you’re starting to feel the gravity of it all. This is your first day together as a married couple, and you want to start it off just right: with a gorgeous reception. Only kicker is- you have loads of people you would like to be there… just not their children. Nothing against kids or anything; it’s just that you know you (and you’re mother in-law alike) will have a heart attack at the sight of little Tommy dipping his fingers in the cake. We don’t blame you! We love kids, but a lot of times weddings aren’t the best place for them to play. If you’re in this boat, you’re probably concerned at what others will think of your decision to not have children at your wedding/reception. Some will support you in it, but some will have strong opinions against it (and won’t hesitate one bit to share them with you). You’ll have to be ready for that. So the question is, how do you break the news that the little dears aren’t invited? This is a concern for many brides, and I’m happy to clear this up for you. You’ll be glad to hear that there are a few different ways this can be accomplished while maintaining formality and respect. Both good! Traditionally, those who are addressed on the inner envelopes are those who are invited to the event. A problem with that is that tradition is slowly diminishing over time, and many brides these days don’t have inners envelopes- just outers. And you and I both know that a lot of people disregard who an envelope is precisely addressed to. It’s a piece of mail, and they’re anxious to open it; the envelope ends up in the trash. 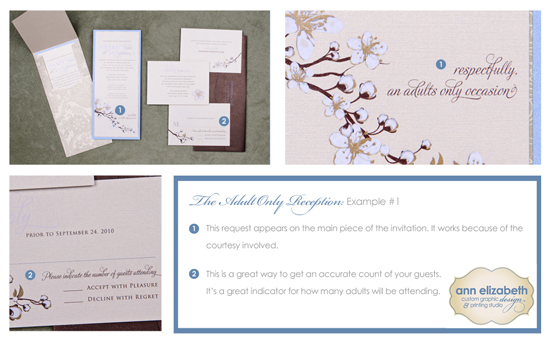 Many brides are concerned that it’s tacky to mention “Adults Only” anywhere on your main invitation. Our answer to that is: it all depends on how you say it. If you were to flat out say, “Adults only,” you can bet your boots that will come off as offensive to many, so make sure to check out our examples below. 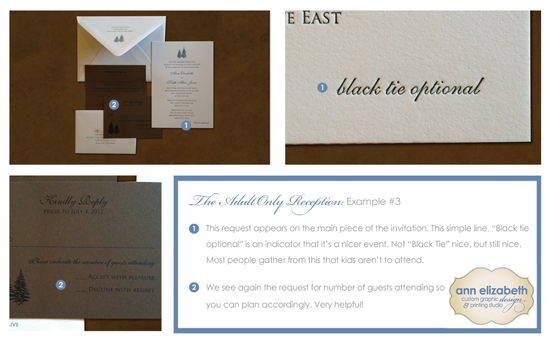 Check out these examples from a couple invitations we did recently. 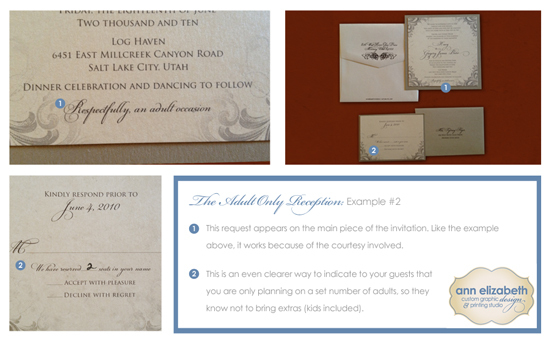 These are options we recommend to make it clear, without question, that only a limited number of guests are anticipated. If leaving the kids out is out of the question, but you’re still concerned they’ll be a nuisance, an option is to offer a babysitting service at your reception. Plan fun activities to occupy the children’s hands and minds, like a photobooth, crafts (so many great kids’ crafts can be found on Pinterest), etc. The Knot has some great suggestions in this article for some ways to keep the kiddos busy. There are various options for every event; if your event happens to be formal enough that kids would be a distraction, by all means, feel free to request that they stay at home. Keep in mind that a great wedding maintains the balance between the comfort of the guests and the wants of the bride and groom. You know better than anyone how the event should go, so make it happen! You’re most likely wondering what to do next. If you’re still undecided, I would suggest doing some more research on options for you. Each wedding is different, so you have to be the one to really do some feeling around and see what’s right for your event. Chances are you’re not quite sure whether or not your guests would cringe at the idea of a children-free event (or visa versa). Ask them! Don’t hesitate to get feedback from a few choice people you trust. Visit with your spouse-to-be and see what they think. You two will decide together, and between you and me, your guests will deal. Last, but certainly not least, don’t stress! Your day will turn out great, and you’ll look back on it with fond memories. Good luck and let us know if you have any questions! PS, make sure to share this with your friends! We know you know someone who could benefit from this.